What is green and purple and DC collectors always want more? 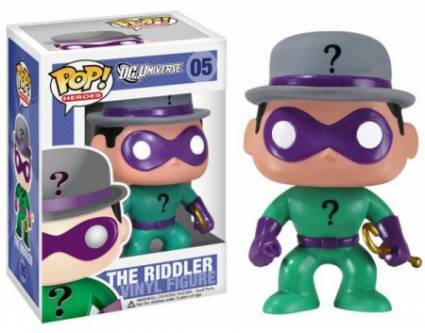 Funko Pop Riddler figures, of course! While Edward Nygma, sometimes spelled Nigma, first appeared in Detective Comics #140 (1948), it was Frank Gorshin's portrayal of the Enigmatic Egotist on the live-action Batman television series of the 1960s that helped the character soar to new heights. 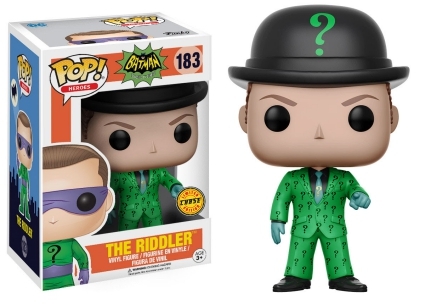 Honoring this is the Funko Pop Riddler figure with a gray bowler hat and green spandex. Both items display a question mark that corresponds to the gold cane he carries. 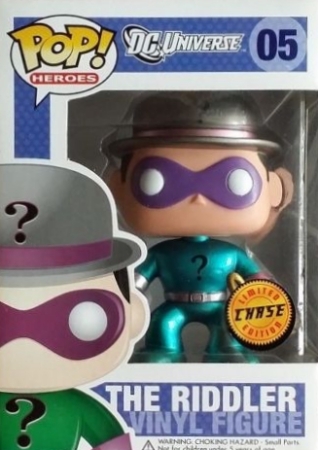 The Riddler metallic chase gives the villain suit a brighter, more turquoise appearance. Order Funko Riddler Figures on Entertainment Earth. As with the Joker, Riddler and Batman go hand-in-hand. 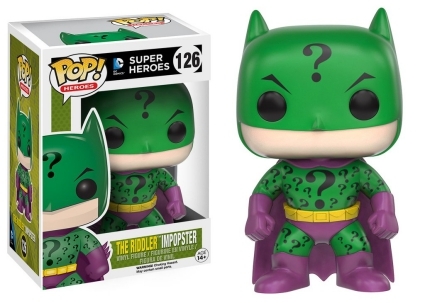 Taking that connection even further, fans can find the Riddler disguised as the Caped Crusader in Funko Pop Impopster. However, we're fairly certain the green and purple suit, plus multiple question marks throughout, might expose who's really under the mask. Additionally, The Riddler receives an updated, yet throwback, appearance in Batman 1966 Classic TV. 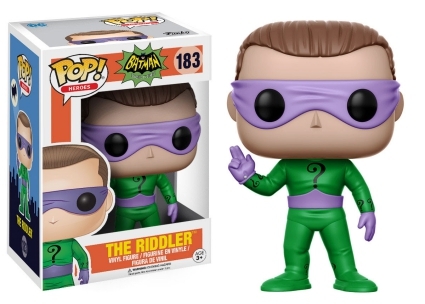 The masked option features a slimmer vinyl figure without the Riddler's signature hat, while the limited chase edition in the Pop! Heroes line includes the bowler along with a green dress suit covered in question marks. Funko Pop! DC Super Heroes #216 The Riddler "Impopster"
Enjoy related Riddler collectible options with our detailed set profiles.